Everyone's kitchen has some secret ingredient to grab the show. Today I am sharing with you all one such spice mix my mother-in-law taught me. This secret spice mix recipe has some basic and minimum ingredients which can turn any curry memorably delicious! My MIL makes it before hand and stores in refrigerator for later use. This post has been sitting for a long time in my drafts and deserved to be published earlier, my bad! Dry roast the peanuts, cool and crush between hands to remove its skin. Combine all other ingredients with peanuts and grind it to a coarse powder. Store it in air tight container. Stays good in refrigerator for up to 2 months. Usage: You can eat it with hot steamed rice with a dash of ghee/neyi/clarified butter. You can use it in any leafy curries using Palak, Thotoakura, Methi etc., or any squash or gourd curries using bitter gourd (kakarkaya/karela), ridge gourd (berakaya/turai), bottle gourd( sorakaya/dudhi), Ivy gourd(dondakaya/tindori), Okra(bendakaya/bhendi) or as per your imagination . 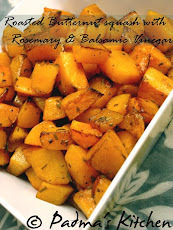 It enhances the flavor and brings nice texture to the dish. I already blogged one curry Koi thotakura fry using this spice mix and many more such stir fries and curries are coming soon from my kitchen. So keep visiting! peanuts in curry powder? That is a great idea, it will give some texture as well as taste... definitely trying this! How kind of you to share such a wonderful family recipe. As soon as I saw the picture I thought it looked so tasty! Sounds delicious! 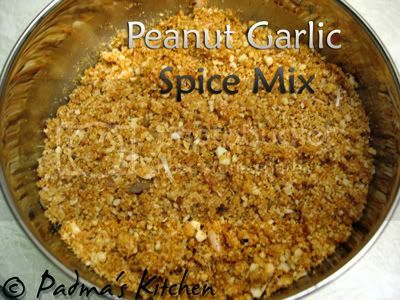 Padma, recipe sounds delicious, bookmarked it I am going to give this a try, however quick question do we grind raw garlic or should I roast it alpng peanuts or seperately, let me know. I love anything to do with peanuts! I will try this.Happy Ganesh Chaturdhi to you & your family.